Based on the 2011 Census, Ottawa boasts a population of 883,390, representing an 8.8 per cent increase since 2006. This growth rate is faster than Ontario (5.7%) and Canada as a whole (5.9%). Ottawa accounts for approximately 70% of the population of the Ottawa-Gatineau Census Metropolitan Area, which had a combined 2011 population of 1,236,325. Population growth is expected to continue. The City's Official Plan predicts growth of 16% over the next 15 years (2016-31). Immigration is a major reason Ottawa's population continues to grow faster than that of Ontario or Canada. 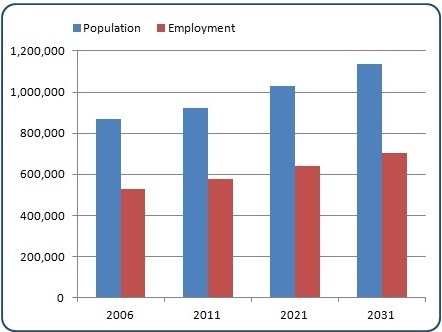 While Ottawa residents are slightly younger than the provincial average (13.2% aged 65 and over in Ottawa in 2011 versus 14.6% aged 65 and over for the province), a significant demographic shift is occurring in Ottawa as the population ages, which is also part of a national demographic change. The proportion of children in Ottawa has been dropping since the 1960s. The population aged 19 and younger made up 40% of the city's population in 1966. Today, that age group represents approximately 23% of the population. 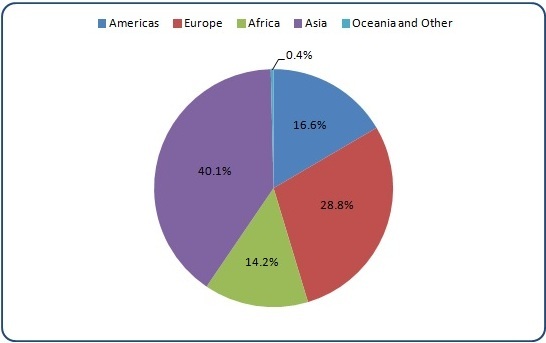 Their share will drop even more to approximately 20% of the total population in 2031. In fact, every age group below age 60 will see a decline in its share of the overall population by 2021. 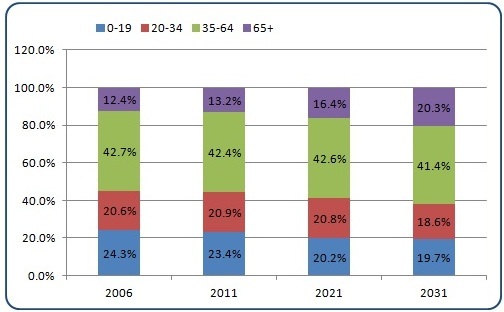 While the proportion of young adults (aged 20-34) was as high as 29% in the mid-1980s, it is now approximately 21%. By 2031, young adults will account for less than 19% of city residents. Mature adults (aged 35-64) made up approximately 32% of the population in the mid-1960s. They now account for 42%, and their share will be roughly 41% by 2031. Seniors (aged 65 and over) represented approximately 7% of Ottawa's population in the 1960s. Their share has steadily risen to reach 13.2% as of the 2011 Census, and is projected to represent just over 20% of Ottawa's population in 2031. Changes in demographics influence the mix of City services provided to Ottawa residents. Ottawa is a significant point of entry into Canada for immigrants from around the world. Statistics Canada data show that immigrants to Canada tend to settle mainly in big cities. Immigrants who settle in Ottawa are attracted by high-paying professional jobs or post-secondary studies. They are typically more educated, earn higher wages, and have higher levels of employment than immigrants who settle in other cities. Ottawa also receives the highest percentage of refugees and family-related immigration of any major Canadian centre. Between 2006 and 2011, Ottawa welcomed 32,485 new arrivals from around the world. Recent immigrants - those who settled here in the past five years - make up 3.7% of the population, down from 4.4% in 2001. Recent immigrants represent the sixth highest concentration in the country. Overall, 202,605 people born outside Canada reside in Ottawa. They make up over 23% of our population. While Toronto and Vancouver receive the most immigrants among the nation's big cities, Ottawa's immigrant population had the third highest growth rate (23%) between 2006 and 2011, tied with Montreal and trailing Edmonton (36%) and Calgary (35%). Ottawa has Canada's third-largest Caribbean community, and the second-fastest growing behind Montréal. As of 2011, there were 22,730 people of Caribbean origin living here. We have Canada's third-largest African community, and the fourth-fastest growing African community in Canada. As of 2011, there were 44,425 people of African origin living here. Ottawa’s Chinese community grew by 17% between 2006 and 2011, the highest growth among Canada's six largest centres, with a population of 40,075 in 2011. Our Middle Eastern community is the fourth-largest in Canada, with over 53,000 people. It grew by 42% between 2006 and 2011, the second-lowest among major centres.